Three more state school head teachers in England have been given top honours in the Queen's Birthday list. John Rowling, head of Nunthorpe School near Middlesbrough, Cleveland, is knighted. Pamela Coward of Middleton Technology School, Manchester, and Ruth Robins, of the Jewish Free School in London, become Dames of the British Empire. There is also a knighthood for the multi-millionaire philanthropist Peter Lampl - champion of clever students from poorer backgrounds. And - in the week Prince Harry left Eton College - the housemaster who looked after him and Prince William during their time there, Dr Andrew Gailey, is made a Commander of the Royal Victorian Order. John Rowling, head of Nunthorpe School since 1984, said he was a "bit stunned" at his knighthood. His 1,400-pupil "beacon" school - which inspectors say offers "an excellent education" - runs an unusual system of extra-curricular tuition. He arranged for about half the GCSE students, whose grades could be improved, to get extra coaching in groups of three per teacher. Their parents had to put up a £10 "bond" which was refunded if the children attended every session. Last year, 79.1% of the 15 year olds got at least five top grades and he said he was hoping for another big improvement this year, thanks to this scheme. Using the principles of the Weight Watchers dieting scheme he also has organised pupils into groups, reporting their grades to each other and setting improvement targets. Pamela Coward in Manchester is a champion of the specialist schools scheme so beloved of government ministers - hers was one of the first technology specialists. 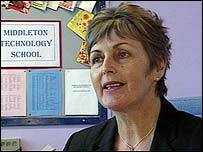 Since 1991 she has taken Middleton from the bottom to the top of the performance tables locally, recently being praised by Ofsted for the quality of its teaching and her leadership. She says the honour belongs to the whole community for their support. "The challenge really is to eradicate street values from the school and to get everybody involved, to get parents supportive and to feel that education is valuable and to give children the confidence to feel they can compete with anyone anywhere," she said. JFS, the Jewish Free School, founded for orphans in 1732, is Europe's largest school of its kind, taking in 300 new pupils each year for an orthodox Jewish education. Last year it moved into new, purpose-built premises in Kenton, north-west London, which were opened by the Prime Minister, Tony Blair. JFS has been singled out in the past by Ofsted as an "outstanding school" and in terms of its results is one of the best-performing comprehensives in the country. It is a beacon school. Ruth Robins has spent her entire teaching career there, starting in the 1970s, apart from a break of two years as a university lecturer in Tel Aviv. She became head in 1993. On becoming a dame she said it was "an extremely humbling experience" but also "a superb accolade" for her profession. "It is equally deserved by the whole team - the teaching team, support staff and governors," she said. Peter Lampl founded the Sutton Trust chairty to provide educational opportunities "for young people from non-privileged backgrounds". He is an advocate of US-style aptitude tests for university admissions. Prince Harry left Eton College earlier this week. With 50 other boys, he had been in ALHGs house, after Dr Andrew Gailey's initials. Dr Gailey is a graduate of the University of St Andrews - where Prince William studies - and Cambridge.